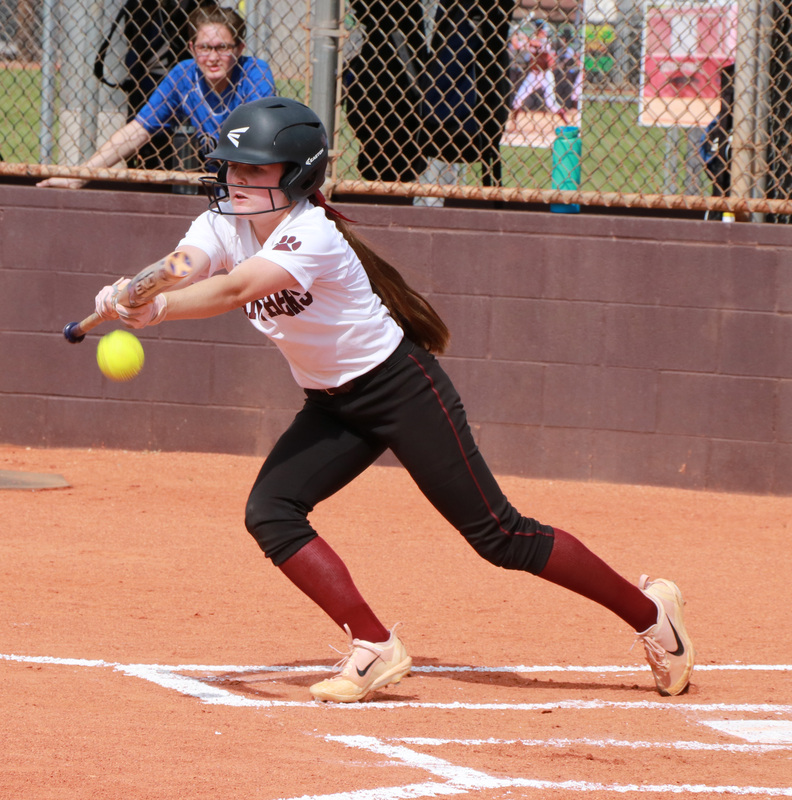 ST. GEORGE — Region 9’s regular season of softball wrapped up at Pine View High Wednesday, as the Lady Panthers defeated the Dixie Lady Flyers 16-1. Neither team qualified for the playoffs this year, so the game merely had bragging rights at stake. Pine View’s six senior players – Abby Neilson, Sydney McArthur, Marquelle Jennings, Kylie Donovan, Ryann Blaser and Kinzie Sullivan – were honored before the contest, which was originally scheduled to be played last week but got rained out. Neilson, Pine View’s pitcher, struck out the side in the top of the first, after which Hannah James of the Lady Panthers scored after walking in the bottom of the first inning. She was advanced to second on a nicely laid bunt single by Leachel Barlow. James was then advanced to third and home on two successive sacrifice fly balls to the outfield, with Neilson hitting the latter for the first RBI of the game. Dixie went three-up, three-down in the top of the second, after which Pine View added four more runs, thanks to a bases-loaded single by Jennings followed by a sacrifice fly by Barlow that scored Sullivan. McArthur later hit a single to score Jennings. Dixie drew yet another blank in the third inning, just getting to its ninth batter in the lineup as Neilson continued to shut down the Flyers. Pine View added four more runs in the third inning, getting hits from Hallie Linford, Sullivan and Barlow. The Lady Panthers led 9-0 after three. 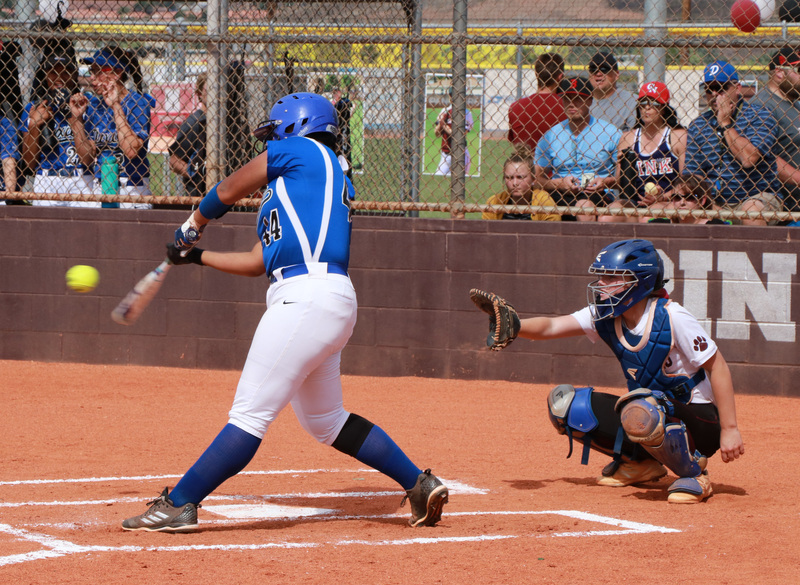 Dixie then broke the ice by scoring a run in the top of the fourth as Kylie Tiffany reached base on a walk and was advanced on hits by Kylee Terrell and Chayden Chong. However, Sullivan threw out Terrell at third base as she was advancing on Chong’s single, ending the inning. In the bottom of the fourth, Pine View scored the necessary seven runs to end the contest early by invoking the 15-run mercy rule. James belted a three-run homer over the left-field fence. The game-ending play was Barlow crossing home plate on a passed ball after stealing third. Neilson held Dixie to just two hits and a walk while striking out six batters and picking up the win in the final game of her high school career. Tuesday afternoon at Canyon View, the Lady Falcons hosted Hurricane in a game that had gotten rained out at the beginning of the season. Canyon View beat the Lady Tigers 13-3 in five innings, thanks in large part of a solid pitching outing by Jordan Nielson, who also drove in two RBIs as a batter. Teammate Taylee Braegger drove in three runs. The Lady Falcons scored eight runs in the third and tacked on four more in the fifth and final inning. Canyon View finishes the season with an 8-9 overall record, 6-6 in Region 9 play, landing them a No. 4 seed in the first round of the 4A state playoffs, which are scheduled for either Saturday, Monday or Tuesday at the home fields of the four No. 1 seeds in the four 4A regions. Canyon View will face a tough test in its first game, scheduled for noon Monday, against Spanish Fork (21-1, 11-0 in Region 10) at Spanish Fork. The top-ranked Lady Dons are seeking their fourth straight 4A title. Region 9’s top seed, Cedar High (19-6, 12-0), will host three other teams in the 4A playoffs’ opening rounds Saturday: Mountain Crest, Stansbury and Orem. Mountain Crest and Stansbury will play each other first, at 10 a.m., followed by Cedar and Oren at noon. The winning teams will play each other later the same afternoon, as will the two losing teams. The team that loses twice is out, but the other three will advance to play in the state 4A tournament May 17-19 at the Spanish Fork Complex. Region 9’s other seeds face a similar situation. At 1 p.m. Monday, Desert Hills (22-4, 10-2), Region 9’s No. 2 seed, will face Region 10 No. 3 seed Lehi at the Deseret Peak Complex in Grantsville. Host team Tooele (22-1, 12-0), Region 11’s top seed, will face Logan in the other matchup at that site, also at 1 p.m. Again, the winners and losers will then play each other for a shot at the state quarterfinals and beyond. Meanwhile third-seeded Snow Canyon (15-9, 8-4) will travel to Bear River High in Garland for its opening round game Tuesday at noon against Uintah, Region 10’s No. 2 seed. Bear River (20-5, 9-1) will face Ogden (5-8, 5-7) in the 10 a.m. game at Bear River. The winners and losers will then face each other, the same as indicated above. Updated May 11 , 6:45 p.m. Due to rainy weather forecast in Northern Utah for Saturday, three of the four regionals originally scheduled for that day have been moved to early next week. Cedar’s schedule did not change, but those at the other three locations have been updated accordingly with the new dates and times. Also, Region 10’s teams finished as expected, so the phrasing in the article was also updated to reflect the finalized opening-round pairings.